I had to do another style post for the last episode of Dating Rules from My Future Self, "U Can Get It if U Really Want", because Lucy's closing outfit is so adorable. I'd definitely wear something like this--and I don't usually wear pants! But this outfit is just too perfect. I hope Dating Rules comes back for another season. I'll let you know if I hear anything. EDIT: Ooo! I just found out on the Dating Rules Facebook page that they're working on a second season! I can't wait to see the outfits. 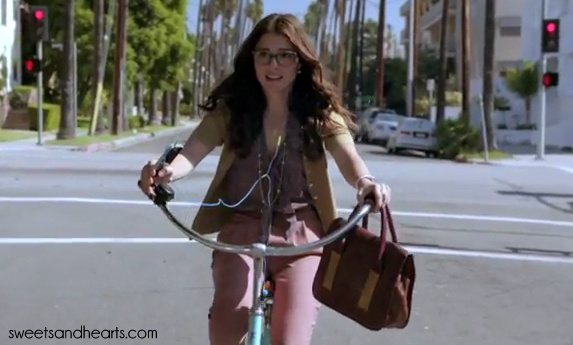 In the last half of this episode, Lucy dresses up a pair of pastel pants with a floral blouse and contrasting cardigan. The muted color palette works is neutral enough for work, but still contains lots of pretty colors (pink, mustard, brown). Lucy's vintage/modern style is so great because she never worries about matching perfectly, but everything comes together so well anyway. Don't be afraid to experiment with color combinations or mixing prints and textures--you can create a unique look that way. To get Lucy's preppy pastel look, pair a tucked-in tie-neck blouse with a whimsical print (this one has elephants on it) with slim pastel pink jeans. Layer a yellow cardigan over the top and pants, and loop a dark brown leather belt around your waist. 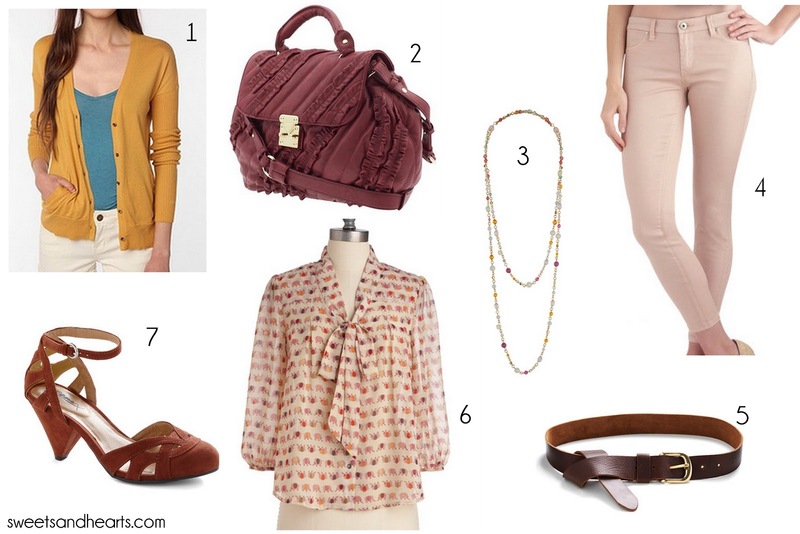 Add some vintage-inspired brown heels, a long beaded necklace, and a wine-colored satchel to finish it off. I hope you had as much fun checking out the style re-caps and inspirations as I did making them! You can watch episode 9 here. 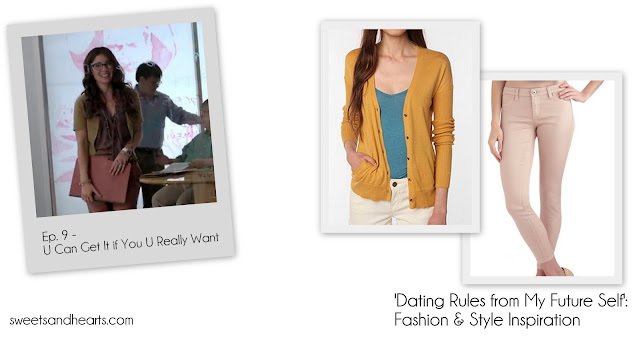 For more Dating Rules fashion, click here.